Guruji teaches us to live in a way that uplifts the world. She teaches us to live in the fullness of the capital “S” Self. She has dedicated more than half of her life to attain the ultimate and bring those teachings and practices to us. Guruji has provided a rich tool kit for those who want to pursue the ultimate goal, those who are driven to teach and those that want to relieve their own pain. Yet Guruji provides even more than the teachings and practices. She showers us with the Grace of the lineage. Over the centuries people who were called would sell all their belongings. They would leave their home and family to pursue what Guruji and the Svaroopa® Vidya Ashram programs offer us. As her devotee and disciple, I consider it a privilege and obligation to preserve the lineage through practice, scholarship and support. As a yogi or yogini, you are reading this now because one or more teachers or spiritual advisors pointed you in the right direction. I came to yoga to heal my body and stop the pain. What I found was a teacher who spoke of the Divine. That teacher led me through the healing practice to the Divine relationship we all long to cultivate. Don’t get me wrong. I came to yoga to help me with the rest of my life and it did. The pain was soon gone. I was back “doing” my life even faster with more energy and capacity. It was years before I actually started to see and feel my body. I was slow to understand the true message my teacher was bringing me. Ultimately, the changes in body and mind were fueled by the Grace of Swami Muktananda and Bhagawan Nityananda. They were delivered by Guruji through my teacher to me. I am learning to allow “Doing” in the world to arise from “Being” in my Self. I want to be self-realized, and I am committed to helping anyone else who is pursuing that same goal. If that goal compels you, too, there are three ways in which you can support it. One facet of the Ashram’s mission is to support those who have the calling to teach Svaroopa® yoga. We must enable them to live in the world while they are training to be the next generation of yogis and yoginis. When you donate during our “Inspiring the Next Generation” campaign, you can specify that your contribution goes to expanding our scholarship program. Or you may want to donate to Swami Support. That donation goes toward freeing Guruji for more teaching, more writing, more of what uplifts each of us in this community and reaches into the wider world. A third option for your donation is to the General Fund, which supports the Ashram infrastructure of staff, utilities, information technology, facility maintenance, etc. etc. Please join me in making a donation, in any amount that fits your budget. You will facilitate the progress and success of your yoga community. Ensure the flow of Grace is strong and unbroken. This entry was posted in Ashram News on May 30, 2017 by Svaroopa Vidya Ashram. MahaShaktipat is the ultimate gift, the initiation into Knowingness and Beingness. Swamiji celebrates May 31st as her birth into her Self, more important than the day on which she was born into this world. Thus, May 31st is a Holy Day for us. It was the day our Guru received what she now gives to those of us who would like to receive the ultimate. I received my first intentional Shaktipat at a Retreat in Boston. Yogeshwari sponsored it at a retreat center. I went to support her (strange reason) since she had come to teach here in Wisconsin so many times. I arrived a day early and, with others, helped her set up. I helped with making photo copies of Sri Guru Gita for each of us to use. It was quite an effort, but we did it on time in a little town nearby. We were so excited. Whatever started there opened my heart more fully to Swamiji as my Guru. Since then, I have never doubted her nor what she asks me to do. During the weekend, my heart felt like it was bursting open inside my chest — again and again. I did not fully understand Kundalini. I was not ready for all she was doing inside and outside for me. But now her work continues. My gratitude is unlimited and just grows and grows. How can that be possible? Swamiji is the best role model in sharing her continual gratitude towards Baba, her Guru and my Grandpa Guru. As her May 31st Shaktipat birthday approaches. my love goes out to her, to Baba, and to Nityananda too — and on to the entire lineage. We do all reside as One in my heart. We are all together in the flow of Guru’s Grace that is unending. My first Shaktipat was March 5 2016, at Svaroopa® Vidya Ashram. The month before, I briefly met Swamiji for the first time before at Foundations. At Foundations, the stirrings of Divine energy, which I had felt in the past, were given the name of Kundalini. I went into the program not knowing what to expect, but I had a deep knowing that this she was my Guru and this was my path. The first day, I experienced the halahala poison of doubt and anxiety. The second day, my Guruji burned away my doubts and gave me direct experience and access to my Self within. I experienced heart opening kriyas that gave me the capacity to accept my Guruji’s love. By the end of the retreat, I was full to the brim! 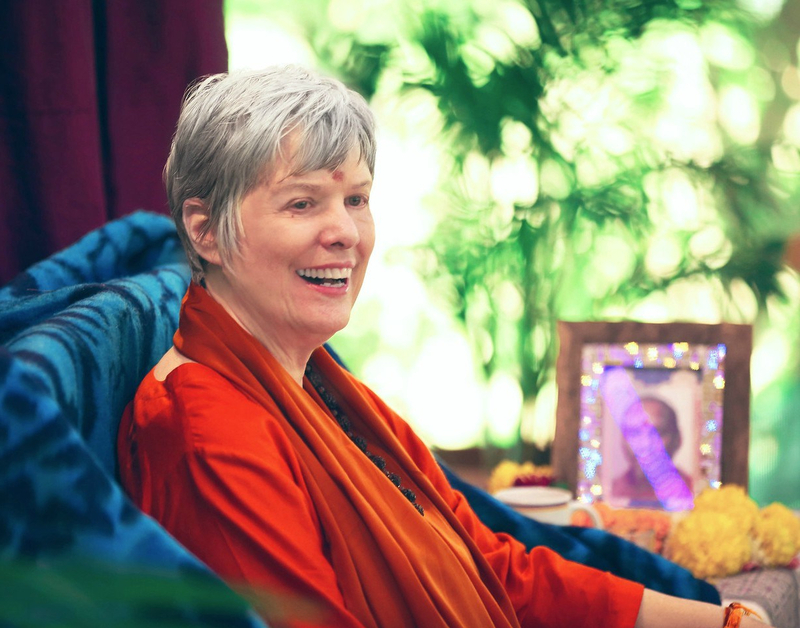 Swamiji gave me everything, and I lay my head at her feet in gratitude and loving service. My first intentional Shaktipat occurred at a retreat in Massachusetts in 2012. The following February, I was off to India with Swamiji, spending time in Ganeshpuri and then on to the Maha Kumbha Mela in Allahabad, the largest gathering on earth. I had no intention of going to India when I set off to see what Shaktipat was all about. I could list hundreds of reasons for not being the “go to India” kind of person. Through the gift of Shaktipat, however, I found another layer of my being, one less defined by my fears and limitations. I went to India as Ellan and came home as Shanti. The changes in me caused ripples through my family as well. So far I have not felt the need to go back to India, but I have gone to many Shaktipat retreats. I intend to attend more, because each time another layer of my own Divinity is revealed to me. My first Shaktipat was on June 20 2013 in North Andover MA. Swamiji told us there were different intensities of Shaktipat, which reminded me of the different intensities of espresso. On the first day, it felt to me like a 12 on a scale of 1 to 10. When Swami touched me, I felt energy rise up and go through my upper back and neck where it had previously been blocked. I felt Kundalini go all the all the way up into my head, then down into my hands. My hands stretched straight in front of me and my fingers extended and froze for a moment. My mind said, “Should I be scared that my hands will stay paralyzed?” I decided not to be scared. I felt so safe. I felt like a lever on a faucet had been opened in my lower spine. Something changed in that place forever after that. I kept that feeling of awareness in my lower spine for a long time. My first intentional Shaktipat experience was not the explosive “aha” moment my mind was hoping for. Instead, I was given “more” — an ongoing, inextinguishable yearning for Self, Grace, God and Guru. Guru’s Grace and my daily practices continue to unwrap Swamiji’s gift of awakened Consciousness. This initiation was the gift of my life. I am forever filled with amazement and gratitude to Swamiji. My first Shaktipat experience happened in (probably) April 2000. Swami Nirmalananda (then Rama) gave a heart opening weekend in a studio where I taught another yoga style. There were towers of plaid blankets that she had shipped from San Diego to Concord MA. In Supported Fish, a bonfire raged in my low back. I was given a folded blanket to support my hips. Less fire, more confusion. “I’m a yoga teacher. Why am I the only one in this room of 20 students who needs extra propping?” Of course, the physical reason was a super-tight spine. But looking back, I see that fire as Kundalini, fueled by Swamiji’s Presence. I am thankful to say that conflagration began clearing the way. It led me onto the Svaroopa® Vidya path. It continues to burn through “stuff” on my way to Self. I was at my first retreat with Swami (Rama back then). After the second night of our program, she told us that we might get the call to meditate at 3 am. While I was excited about the possibility, I was also doubtful. I had been trying to be a morning person for over a decade and was failing miserably. But, sure enough, at 3 am, I woke up, and the call to meditate was very tangible. I sat to meditate. After a few minutes of japa repetition, in the distance I could hear what I called “white noise.” As it grew louder, I realized it was Om — or what we approximate when we say “Om.” As I sat, I experienced Om vibrating. It drew closer and closer permeating all objects animate and inanimate. I could tell that it was going to permeate me as well, but I could not let it. I opened up eyes in wonder of the experience I just had. It felt like only a few minutes had passed, but when I looked at the clock it had been over an hour. I went to my first Shaktipat knowing very little about Kundalini and even less about Shaktipat diksha. I simply trusted that I wanted the “more.” It was quite an awakening! I remember having Guruji touch my forehead for the first time. In that instant it felt as though she was reaching down through my head and spine right to my tailbone. I also remember seeing the image of doors, from which I looked out at the world, being blown open; as from a sudden gust of wind that scared some birds from the nearby trees. My view was forever changed. This entry was posted in Ashram News on May 29, 2017 by Svaroopa Vidya Ashram. To express your thanks is one of the easiest ways to melt your heart. To feel grateful is to pause in a moment of sweet surrender… Yoga says, “Just let go!” Let yourself be overwhelmed by the beauty of the moment. Give over to the majesty of the space between the ticks of the clock. Gratitude is one of the best ways to do this. Where would I be without the many teachers who have inspired me along this yoga path? I can think of many for whom I am so grateful. They include my dear friend who gave me her copy of the Primary Practice video tape 12 years ago. They include as well my local Svaroopa® teacher, my Teacher Trainers and DTS mentors. Also included are the many “Guru siblings” from whom I learn so much as we cross these oceans together. Of course, Swami Nirmalananda is the Foundation, the Essence, the Source. She carries her Baba’s teachings and keeps them alive, as he and many others carried Nityananda’s teachings. Now our newly trained Svaroopa® yoga teachers and Svaroopa® Vidya meditation teachers carry Swami Nirmalananda’s teachings far and wide in today’s world. Where would we be without teachers!! Please join me in this yogic practice of gratitude and sweet surrender. Inspire and support the next generation. Donate your one-time gift, or pledge your monthly contribution to our Scholarship Fund. The Ashram’s policy is to allocate 10% of tuitions to scholarships, and your donation will make it possible to expand this. Or contribute to the Swami Support Fund and allow our Guru to focus more on teaching and writing, and less on administrative tasks. This, in turn, supports the next generation, as well as current teachers. The choice is always yours. Do more yoga! This entry was posted in Ashram News on May 23, 2017 by Svaroopa Vidya Ashram. My first yoga teacher was Ronna Sanchez. I will be forever grateful for the years of training and personal practice she had done before I ever walked through her classroom door. She offered the Svaroopaâ Yoga Gentle class that my physical therapist recommended, and which I reluctantly agreed to try. Despite the strangeness of all those blankets, the music (tamboura) and the words (Sanskrit), I was hooked. Lying in that final Shavasana, I thought, “I don’t know what this is, but my body really likes it.” “It” was the flow of Grace — I just didn’t know that yet. “It” was the upwelling of my Self. “It” would heal years of chronic pain and unwind the mental and emotional patterns beneath that pain. Such a gift! Have you received such wisdom and blessings from your Svaroopaâ yoga practice? If so, you can credit not only your teacher, but your teacher’s teacher — Swami Nirmalananda Saraswati. And you can also credit her teachers, the lineage of Gurus who came before her, including Baba Muktananda and Bhagavan Nityananda. After returning from a recent Shaktipat, I added photos of Muktananda and Nityananda to my home puja. For years Swami Nirmalananda’s photo alone had been the focus of my devotion. It was as if I had compartmentalized her Grace. Then I realized that without her Guru, and her Guru’s Guru, she would not be here to serve us today. And with that I was able to expand my gratitude back through the lineage in a whole new way. While the teachings are elevated and mystical, the Ashram, Swami, Svaroopaâ yoga teachers and Svaroopaâ Vidya meditation teachers are grounded in the real world. That means there are real world necessities to make the teachings available. And they require financial support. When you provide financial support to the Ashram, you are supporting the people who support your yogic process: the teachers. Please pay it forward. Join me in making a donation to our Inspiring the Next Generation campaign. Thank you. This entry was posted in Ashram News on May 16, 2017 by Swami Nirmalananda. Recently I had lunch with a coworker who does yoga at her health club. Because her yoga teacher had left the club, she was looking for a new one. I suggested she find someone registered with the Yoga Alliance at the 200- or 500-hour level. I explained that would ensure the teacher is qualified. Then I remembered that Swami Nirmalananda was the founding president of the Yoga Alliance. It’s inspiring to me that Swami helped develop training and accreditation standards for USA yoga teachers decades ago. She led the way for a whole generation of yoga teachers, myself included. Swami gave me what she was given, the spark that lights the fire of yoga. Initially I had no desire to be on a spiritual path. But by just doing the Svaroopa® practices, I received shaktipat. I received spiritual awakening and everything that goes with it. It inspired me. If I could go to a class and receive this, I knew I needed to become a yoga teacher. Swami Nirmalananda has also inspired me because she’s done things in the real world, like leading Yoga Alliance, starting an international yoga teacher training program and founding an Ashram. She has shown me that you can accomplish things. And you can do that from a deeper place within yourself. My primary career is as a product development scientist. I have super-duper busy mind. I used to consider myself an intellectual, able to solve any problem. I was so wrapped up in my ability to think that it distanced me from others, and more importantly, from my Self. Like a fist, my mind used to be so tight it was useless. Because of the Svaroopa® practices and the path that Swami opened for me, my mind isn’t tight any more. I’m more creative and much more open to other people. As a scientist now, I don’t immediately make my mind up about something. I am open to possibilities I wasn’t open to before. Solutions to problems come much easier than they did before. I want others to have this kind of experience. So I see the value of providing scholarships for teacher training to continue taking Svaroopa® yoga into the world. If the next generation isn’t trained to carry on, the teachings will die. We rely on the teachers to show us the way. Swami asks, “What if we could triple our scholarship fund this year and make it so much easier for people to come?” It’s a challenge we on the Ashram Board is taking on. We respectfully ask for your help. It’s also important to support our Master Teacher, Swami Nirmalananda. I want Swami to be writing, teaching and making recordings, not being an administrator. Anything we can do to free her from administrative work helps us become immersed in the One Self being all selves. In our “Inspiring the Next Generation” spring fundraiser, I will be financially supporting those who have supported me, and those who will carry the teachings to new teachers. When you open your heart to donate, you open the door to Grace. I hope you will join me by making a donation that has significance for you, because this is really about you. This entry was posted in Ashram News on May 9, 2017 by Svaroopa Vidya Ashram. I am one of the few Board Members who has not taken Yoga Teacher Training (YTT). As a longtime student in my local Svaroopa® yoga class, I see what other students get. I am aware of Grace coming to me through Swami Nirmalananda. And I see they are receiving her Grace too. I see it in the ways that they change over time. Their physical changes — better health, more comfort — are visible and important. But what goes on internally is even more essential, to them and their families, to our local community, and ultimately to the world. Even if they are not yet aware of the uplifting, it’s clear in their commentaries. Early on, their responses tend to focus on physical changes. Later, they experience a deeper internal change. I see those same changes in myself. I know they come directly from my participation in, and cooperation with, what I have received. It comes from my teacher’s skillful, compassionate in-class guidance. Through my local teacher, Grace comes from Swamiji to my fellow students and to me. As we students change, I also see how local teachers and our Weekend Workshop Leaders evolve over time. They get better at teaching! They embody the teachings. That embodiment empowers them to communicate much more fully to us students. Our enhanced well-being is good for us, for our families and friends, for our community. Yes, it’s a boon to humanity. Think six degrees of separation. Each of us who has been uplifted spiritually confers a portion of that inner change on everyone that we touch. The benefits spread more and more widely. We who are Svaroopa® yoga and meditation practitioners stand on the shoulders of those who have kept our lineage unbroken from ancient times, including Bhagawan Nityananda, his disciple Swami Muktananda, and Baba’s disciple — our own Guru, Swami Nirmalananda. Now let’s keep it going. We understand the need to support younger teachers coming into YTT. As established householders, we know the realities of making a living and sustaining ourselves and family. We who are already established as householders know what the next generation of Svaroopa® yoga teachers face as householders. To inspire and prepare our next generation of Svaroopa® yoga teachers, we as a community need to support the Ashram and to support the upcoming generation. Expanding our ability to provide scholarships to students in financial need can only happen through the generosity of those of us who have already received so much. In short, the future of Svaroopa® yoga and meditation needs your financial support. Please join me in contributing to our spring fundraiser, Inspiring Our Next Generation. This entry was posted in Ashram News on May 2, 2017 by Svaroopa Vidya Ashram.